Western Australia Premier Mark McGowan officially opened Rio Tinto’s newest Western Australian iron ore mine, the $468 million Silvergrass project, which is located within Rio Tinto’s Greater Brockman mining operations about 70 kilometres north-west of Tom Price in the Pilbara region. Production using the new primary crusher and conveyor will begin later in the year. The project created 500 construction jobs, and will sustain about 250 ongoing positions once it is complete. Silvergrass plays a key role in Rio Tinto’s plans to reach a production rate of 330 million tonnes this year, and its low-phosphorous ore is crucial to maintaining the quality of its ‘Pilbara Blend’ of ore. Rio Tinto’s Pilbara iron ore operations include 16 mines, four shipping terminals located at Dampier and Cape Lambert, a railway spanning 1,700 kilometres and a workforce of more than 11,000 employees. The new mine will produce 10 million tons of ore a year. Premier Mark McGowan said: “Western Australia’s leading iron ore sector produced 38 per cent of the world’s iron ore last year, and plays a vital ongoing role in the State’s economy through jobs and royalties. The Silvergrass mine is the latest in a series of new mine developments by a number of major companies, which show that confidence in the State’s sector remains high. 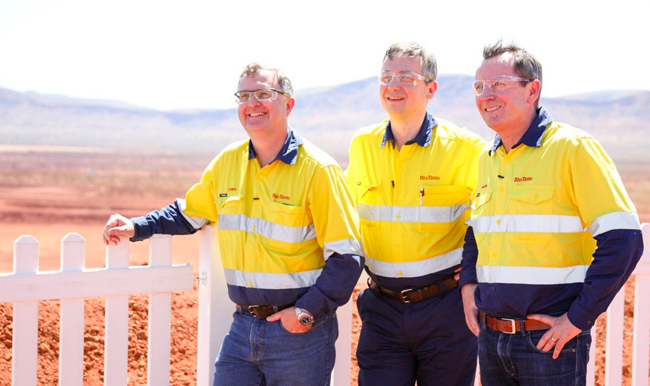 Photo: Left-to-right, Rio Tinto iron ore CEO Chris Salisbury, Rio Tinto CEO Jean-Sebastien Jacques, and WA Premier Mark McGowan at Rio’s Silvergrass iron ore mine.